My first confession is that even though I don't' answer questionnaires I secretly think they are really fun. 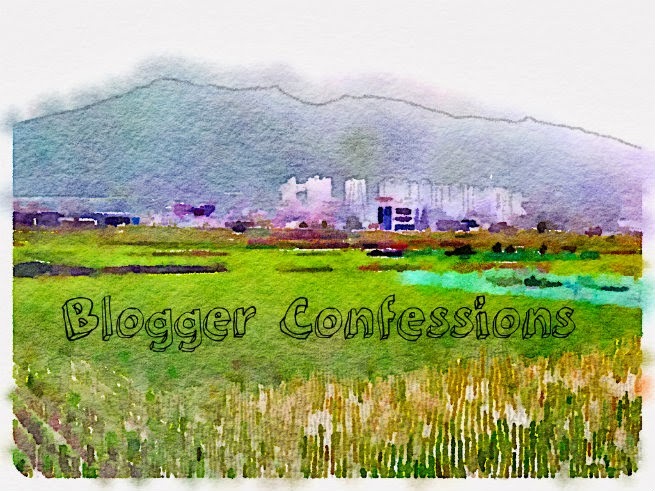 I recently read Blogger Confessions from Robyn and Jenny and knew I wanted to join in. I also thought it would be a good way to reintroduce myself a bit since I have some new readers around here. Hi, new readers! I first created this blog as a way to document my year traveling abroad in South Korea. Sadly, teaching 8-9 hours a day wore me out and I didn't blog as much as I hope to while I was abroad. Other than Facebook & Pinterest - nope. I became serious about my blog this past spring. I knew I wanted to grow my blog and I e-mailed two friends in Korea who had successful blogs. They pointed me in the right direction and gave me a lot of helpful insight. I think I successfully became serious about my blog when I started researching ways to grow your blog, ways to write and present better posts, blog design, etc. I found this post especially helpful with blog growth. A blog makeover by Amanda over at The Suitcase Designs helped my blog a lot too. First blog post was Korea Part 1. Does anyone else look at a first blog post and just cringe? I won't fix it to 'blog perfection' because I think it's good to see how far I have come with my blog. I also laugh at that blog post because my initial expectations and thoughts towards Korea changed so much throughout the year. Not in a bad way but just different then when I first landed. I'd say initially my biggest challenge was just learning blog land. I mean, if you start a job, you have training. If you start school you usually have orientation. When you start a blog it's just you and yourself diving head first figuring it all out. You have writing posts, editing, SEO, pictures, social networking, etc. It's a lot to learn at first and takes some time. Another challenge was 'finding my voice'. I don't know who invented that in blog land or if I even completely agree with it. Why can't people have 10 voices? Meaning, why can't they have a vast array of topics they write about? I will say, that my favorite all time posts to put together have been the missionary profiles. I love sharing about missions and what God is doing. After that I think my biggest challenge was being too focused on numbers. I mean seriously, why do we bloggers count our numbers a lot? A turning point for me was after a few e-mails exchanged with Katie where she mentioned to focus on community rather than numbers. That was a light switch moment for me and made all the difference. Do I watch my numbers? Yes. However, I consistently ask myself if I am building community? Relationships are more important than numbers. New blog friends! I never thought I'd make new friends from blogging. However, living in a small town this past year and being away from my closer friends, my blog friends have been a huge blessing. I've been able to exchange e-mails about: marriage, running, prayer requests, funny stories and much more. I'm pretty certain that some of my blog friends I'll meet up with in the near future. I already met up with Amanda and I'm blessed to have a new friend as well as someone to talk everything blog with. I've also been blessed to read so many posts that have helped me in my walk with Christ. It's encouraging to know that other women out there are striving to honor Christ and spread the gospel through their blogs. I'm going to sound so contradictory after I just wrote number 5 out but I don't understand how I can pour time and effort into my blog sometimes and see minimal growth and then a new blogger pops up and BAM 500+ followers. Seriously, please tell me your secret? 8. What is your blogger dirty secret? -be more creative with sponsorships. I have a couple of things in mind so we will see where it goes. 10. Have you learned to become passionate about anything through blogging that caught you by surprise? I think maybe photography (I think a lot of bloggers can say that). I wanted to get a DSLR while I lived in Korea but didn't do so until this past summer. What about you - what do you most love about blogging and why did you start? Also, if you are a pro at organization and SEO please enlighten me. i'm so glad you did this!!! :) i agree with you so much that the most important thing is building community! i love that i can sit down to read blogs & be so encouraged by bloggers that are sharing their struggles, sharing what they're learning, and sharing hope and the gospel. it really is such a blessing in my day! i love your design too, by the way! so fun! I agree with you, I think it is nice to keep your first blog post imperfections and all to see how far you have grown as a blogger. This was fun to read Beka! #7 made me laugh because it's true for me too haha! I had no idea that blogging could create a community when I first started! Oh girl you don't even want to see my first post Baahaha too funny! It's still there but it's horrible! When you find out that secret to getting BAM 500+ followers, you let us all know! Thanks, Robyn! Yes to the yes about community! I wish all my blog friends lived in the same city! It would be so amazing! Thanks! I fixed some of my posts from when I was in Korea but some I left just how they are. It sounds like blogging was a bit therapeutic for you as well. Thanks for the compliment on my blog. I do agree that being true to what I love and building community helps growth. I don't think anyone is completely an expert on blogging or blog growth but I do believe I can learn a thing or two from everyone and use that to help my blog. I'm so going to go read your first post now! We should create a link-up 'my first post' ha ha! It would be funny and fun. The only secret I have is hard work. It takes some serious time and dedication ... which I didn't know it would until I jumped in head first. Oh no haha I don't know how to do an archive..? We so should! It would be so fun! If you go in the top left corner and search yet to be determined you'll find it! #5 part 3 - yes! Please tell me the secret of getting hundreds of followers in a couple months, haha. But no, it's so true - it can be so discouraging to pour so much time and effort into this little part of the web and see no fruit from your efforts. You know? Love this post and getting to know more about you!